In the first place, people have to establish the due psychic connections between the interpreter and the person who wants the reading. The interpreter of the Tarot will need to project himself to the psychic part of the person who wants the reading; this will allow him to explore the unconscious and get closer to future possibilities. The most convenient is to make an invocation asking for help, asking for a card and, when the process is over, if the possibility is open. The reader has to mix the Tarot cards, to neutralize possible vibrations that had remained in it from a past reading and give them to the asking person so he can make the circular movement and give them back to him. After this process, we can reconstitute the deck and start creating a range of cards. 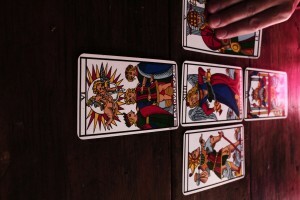 It has to be as much open as possible so the person who needs the reading can choose the cards he wants easily. It is recommendable not to cut the game after this process, as it can make vary the vibrations that are established. Es recomendable después de esta práctica no cortar el juego, pues esto podría perturbar las vibraciones que se establezcan. This way to read the cards is the reflex of the consultant and it is only made with the major Arcana. It will be asked to the consultant to choose four numbers randomly, they are summed and if the result is higher than 22, the components need to be added. The number of the resulting card will give us the arcana that will be in the center of the star and that is used as card to reflex the question made. After this process, the reader will put a card in the left side of the first one, which will correspond to the card of the consultant. Another card is placed in the right side, which represents the external world; one on the top of the main one, which will represent the psychic help and, finally, one on the bottom, which will represents the realization about which it can be calculated.